Human papillomavirus (pap-ah-LO-mah-VYE-rus) (HPV) is the most common sexually transmitted virus in the United States. Almost every sexually active person will acquire HPV at some point in their lives. 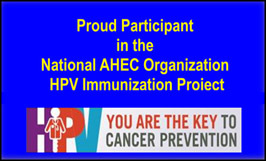 The National AHEC Organization National Training Center is embarking on the Improving HPV Immunization Rates on a National Scale Utilizing the National AHEC Network project. The project will work in partnership with the Centers for Disease Control and Prevention to improve the HPV immunization rates of 11 and 12 year old, males and females, throughout the nation by improving clinician training and understanding of the vaccine. To complete this project, 10 regional HPV project coordinators were hired to work closely with selected AHEC entities in each state within their region to establish and maintain links with appropriate resources. Corryn Celmer, Program Specialist with Yankton Rural AHEC, is the Region H Coordinator. States in Region H are: Colorado, Montana, North Dakota, South Dakota, Utah and Wyoming.